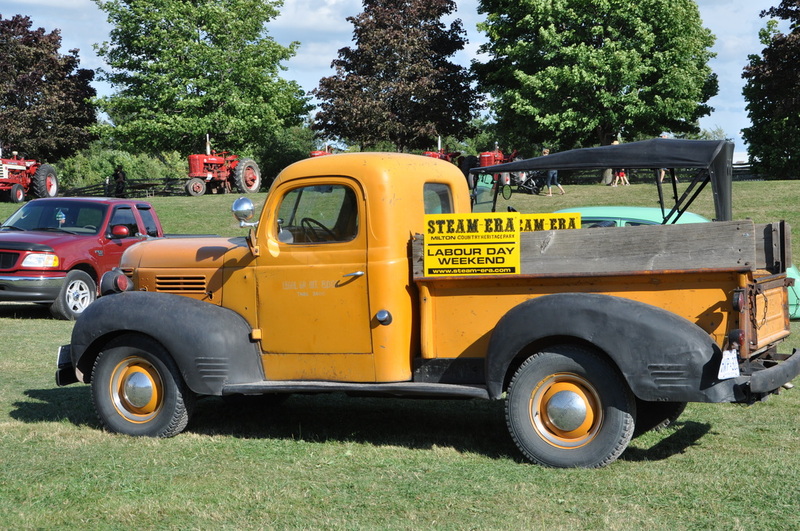 Steam-Era is the annual Labour Day Weekend exhibition presented by the Ontario Steam & Antique Preservers Association. For the public's education & enjoyment, our members exhibit & demonstrate their collections of equipment, models, cars & trucks, along with crafts, entertainment, vendors & other displays pertaining to our rural agricultural heritage. Each year Steam Era celebrates a particular theme, 2016's is all things steam, and vintage lawn and garden equipment. In August of 1960, Bill Johnson of Burford and Les Lowe of Brookville were at Gordon Brigden's machine shop in Hornby and with the late Elmer Downs of Milton. the four discussed the possibility of putting on a steam show. Later in the fall, after the funeral of a dedicated steam enthusiast in Brantford, it was decided to have a meeting to arrange a show! On December 8. 1960 as a result of these discussions thirty-eight gentlemen gathered at Les Lowe's farm on the Guelph Line, north of Brookville. This was the founding meeting of the Ontario Steam and Antique Preservers' Association. Glenda Tapley acted as secretary for the meeting. but no secretary was appointed that night. Bill Bailey of Brampton was named President, Les Lowe as Vice¬President, and Gordon Brigden was named Treasurer. The next meeting was held January 12. 1961 in the Rockwood Town Hall and there were 79 in attendance. 105 people gathered in Aberfoyle Town Hall February 9, and at the Erin Town Hall on March 9 1961, 86 people showed interest in preserving a segment of the past. The 5th meeting was April 13 in Rockwood Town Hall. Originally, three locations were suggested for a show-place; Erin Fair Grounds, Owen's property at #401 and #6 Highways and at Les Lowe's farm. Sites also suggested were the Caledonia Fair Grounds and the Kohler Air Port near Cayuga. In February 1961 it was suggested that a show be held at the Milton Fair Ground. (Wilfred Crozier was at the February meeting and he was also on the Fair Board). A difference of opinion developed, and some decided to stay with a farm style show and subsequently held the Pioneer and Power Show at Les and Ellen Lowe's farm. The sixth meeting on May 11 was at Aberfoyle Town Hall. The Charter was obtained August, 1961. The by-laws provided for 9 Directors. In 1963 an additional director was chosen. All Directors are elected for a three year term. The Show was started with $5,170.00 in the kitty and cleared $1,000.00; the gate receipts at the first show were over $3,000.00. Considering the admission price was set at 75 cents, all were well pleased! There were antique cars on display, maybe 20 gas tractors and about the same number of gas engines. Antique farm implements, models and household articles complemented the dozen or so steam engines that were on display. The Milton Girls Pipe Band was at the first Steam Show, as were the Ontario Provincial Police providing security. Vic Mountford was the MC for the grandstand show on Saturday afternoon. There had been a fiddle contest the previous night. Ernie Batty was the standby repairman; he had his welder there in case of need. Wally Thomson supplied wood and water for the Show, and drove a truck loaned by Doug Leslie. The Halton Agricultural Ladies Auxiliary had an eating booth. The first show was a two day affair, on Friday and Saturday. Success was great, so great in fact, that the club directors decided in future to extend the show to three days: Friday, Saturday and Monday of Labour Day week-end with the Show grounds being closed on Sunday to all but members. In 2014 the Show moved after a long tenure at the Milton Fairgrounds to Country Heritage Park. Unfortunately in 2019 the rent for this location rose by a factor of ten so the show could no-longer afford to remain there. Thanks to the generosity of the Hume family Steam-Era has moved the Hume Auction Farm and will be better than ever for 2019.